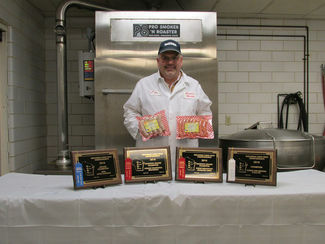 Ken Gempeler holding award-winning Alpine Boy Wisconsin Brats and Southern Style Pork Links, with all four 2016 award plaques in foreground. 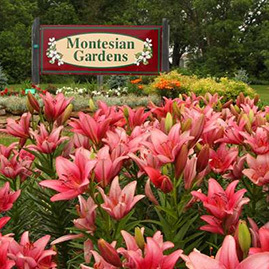 Photo by Katie L. Peterson, Post Messenger Recorder. 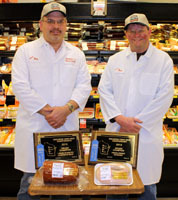 Jeff Kempfer (left) & Ken Gempeler with 2 of the 4 awards earned by Gempeler’s Supermarket at the 2015 WAMP Meat Products Competition. 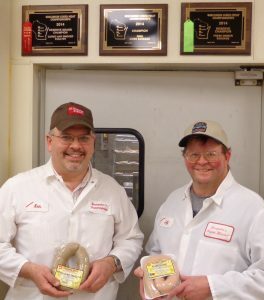 Ken Gempeler (left) & Jeff Kempfer hold 2014 WAMP award-winning Alpine Boy Ring Liver Sausage & Kalberwurst. On wall above them are the 2014 WAMP Award plaques. 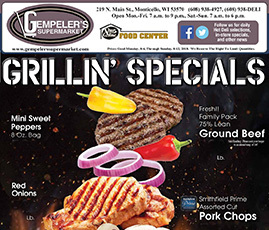 At the 2013 Wisconsin Association of Meat Processors (WAMP) competition, Gempeler’s Supermarket received Grand Champion awards in two categories! Our Alpine Boy Kalberwurst (Old World Swiss Style Veal Sausage) received the Grand Champion Award in the Dinner Sausage category. Our Alpine Boy German Slicing Bologna received the Grand Champion Award in the Large Diameter Luncheon Meat category. 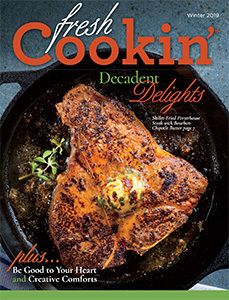 Our Alpine Boy Veal Loaf lunch meat received Honorable Mention in its category. 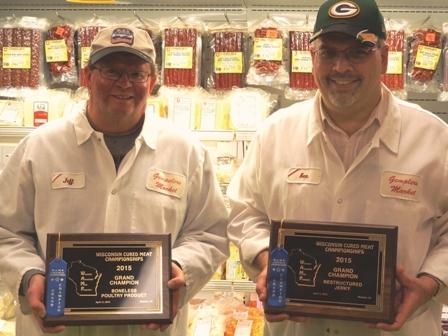 At the 2012 WAMP competition, our Alpine Boy Beef Jerky and Beef Snack Sticks earned Reserve Grand Champion awards in their respective categories.